Like a breath of fresh air, at last a major work on anti-fascism that acknowledges Anti-Fascist Action's pivotal role in the anti-fascist struggle. After years of being written out of history Nigel Copsey has produced an important book that takes an objective view on events. Although written by an academic, and the cost of nearly £50 will presumably restrict its sales to libraries and colleges, the fact that a comprehensive reference book on anti-fascism presents AFA as a key player cannot be underestimated. At last there is research material available that isn't discredited by a narrow sectarian approach. "there are doubts as to whether such a plot actually existed as no prosecution was ever brought. One commentator has even speculated that the plot was deliberately fabricated by Searchlight." The book covers the period from the 1920s onwards, and quite rightly points out that the first anti-fascists in Britain came from the militant Left in response to the murderous anti-working class activities of Mussolini's Blackshirts in Italy. But it is the last chapter, 'Fighting Fascism in the 80s and 90s', that is of most interest to AFA. The fact that there are 35 references to Fighting Talk, which he describes as an "uncompromising magazine", means that AFA's analysis is given due attention. 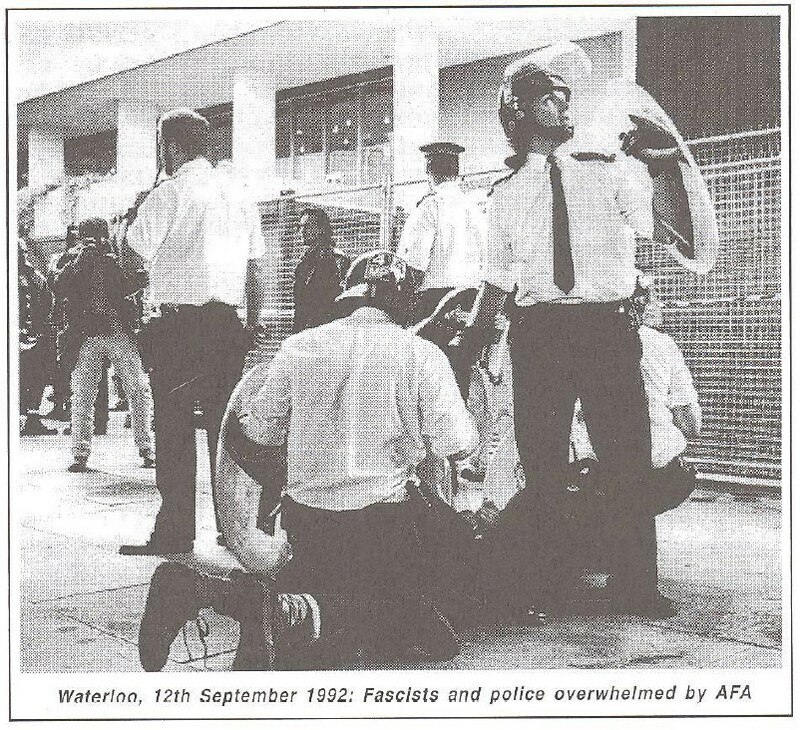 AFA is credited for many successful activities ("BNP election meeting... disrupted by AFA militants'; "...successfully besieged a local public house favoured by BNP activists", etc. ), although most of the references refer to events in London and ignore achievements in the rest of the country. "AFA refused to accept the ARA line that only victims of racist attacks could define the anti-fascist struggle as all sections of the working class were held to be potential victims of fascism." "AFA held that the proposed march served little purpose as there had already been six marches against the BNP's headquarters and 27 lobbies of the local council to no effect." He also covers the subsequent World in Action programme which tried to set up AFA, labelling the organisation 'paramilitary' and responsible for the violence at Welling (despite not being there!). Throughout the chapter all the various organisations (ANL, ARA, YRE, CARF, Searchlight, etc.) are examined, but AFA is clearly seen as being something different, and effective. One of Copsey's main criticisms of AFA relates to east London in the early 90s. Although he mentions a lot of the work AFA did (Weavers Field, Brick Lane, Unity Carnival, National Demonstration Against Racist Attacks) he doesn't pick up on the key point that AFA learnt from this period, culminating in the BNP election victory On the Isle of Dogs. No amount of anti-fascist activity would have altered the outcome of the election - only a political/electoral alternative that proposed a better solution than the BNP's to the genuine concerns that people had could have achieved that. Anti-fascism had reached a dead end. "although anti-fascist militancy can undoubtedly disable the street operations of fascist groups, a problem obviously arises when adversaries change tactics and adopt campaigning methods that avoid the possibility of confrontation." An astute observation, but one that AFA,. uniquely, has been acting on since 1995. There are one or two factual inaccuracies, but overall 'Anti-Fascism in Britain' is a significant achievement. The fact that Copsey disagrees with AFA, but still places AFA at the heart of the struggle, avoids accusations of political bias and makes the book even more worthwhile. This honest approach is probably the reason why you won't have read a review of this book in certain rival publications! Even so, Waterloo was still a major victory for AFA not least because it finally substantiated its claim to the radical anti-fascist tradition.